*If you have a Mac, PuTTY is already downloaded to your computer by default. Download the TerraTerm software following the instructions of the brochure. When using TerraTerm instructions, go to step 4. Windows: Open the PuTTy software. Mac: Write “Terminal” in the search. Be very careful! If you press any wrong button, you will have to start all over again. In this window, choose option number 2 by pressing the number 2 on the keyboard. In this step it is important that you remember the information that it asks for. 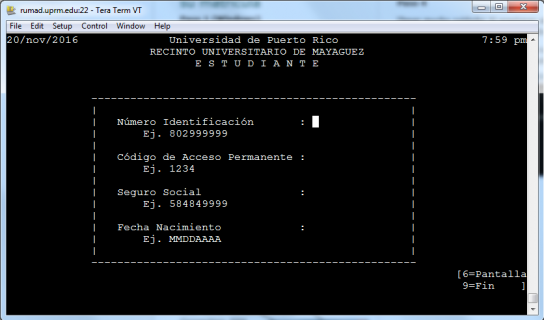 Your student number, the pin you created when you first entered the portal (you can modify it on your portal), social security and date of birth. Select A (“alta”) to enroll your courses officially. You must know the codifications and sections of your courses previously. They can be found in the portal and in See other information in Step 4. 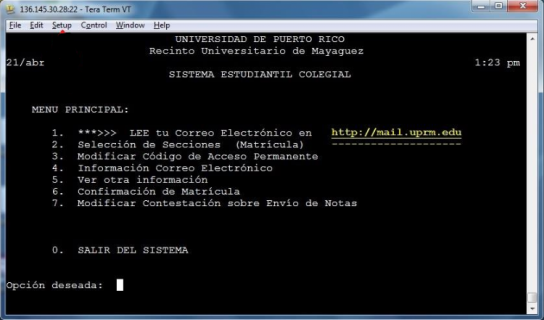 If you want to remove a course you enrolled, you must choose the option B (“baja”). If you want to change the section of a course you enrolled, you must choose option C (“cambio”). This way you ensures not to lose the course already enrolled. To confirm your enrollment, you must be up to date with the academic calendar as there is a period of time to do this. When you pay for the enrollments, it is automatically confirmed. You must have several pre-registrations made before your enrollment turn. The pre-registration is made through its portal. Remember that you should not have more than 5 consecutive hours of class. Remember that your Guiding Students are at your disposal to help you. Be aware of your registration hour and be ready to start the process. In the case of not getting a course, remember that there is a period of adjustment that is found in the academic calendar.